The sfogliatella is probably one of the best-known Italian pastries abroad. Hard to get right, in Naples they are made with the ancient know-how that produces pastries a world apart from even good ones found outside the city. They consist of a layered shell of crispy pastry, filled with crema pasticcera with a hint of Sorrento lemons. The pastry is slightly salted, which sets Neapolitan patisserie apart from the rest of Italy and shows centuries of French influence on the city’s cuisine. Legend has it that the sfogliatella, was invented by a nun from the convent of Santa Rosa on the Amalfi coast—which today appears to be a posh hotel— who was trying to use up leftover ingredients. With a pinch of divine inspiration, the sfogliatella was born. The mother superior was so impressed that she sold them to the public through a hole in the convent wall. The Fratelli Attanasio have been making sfogliatelle in Naples, using the same traditional oven since 4 October 1930 and today are considered masters of their art. The sfogliatelle, and other pastries, are always warm from the oven, since they practically walk out of the shop and so are being constantly made. The shop is located not far from the central train station in Naples and so is a perfect place to rush to when arriving in the city. Don’t be put off by large queues outside, since they operate a number system and are very efficient. Their strapline is: ‘Napule tre cose tene e belle… ‘o mare, ‘o Vesuvio, e ‘e sfugliatelle.’ (In Naples there are three beautiful things … the sea, Vesuvius, and the sfoglliatella.) You can find them open from 06.30-19.30 from Tuesday to Sunday in vico della Ferrovia 1-4, 80142 Napoli. I’ve only ever seen pizza fritta in Naples and perhaps it’s because, let’s face it, it’s a bit of a calorie bomb—but you don’t visit Naples every day, do you? The closet thing to this outside Naples is the calzone (a stuffed pizza shaped like a half moon) but there’s one major difference. While the calzone is baked in the oven, the pizza fritta is deep fried. Can i manage a whole one? Long part of Neapolitan street food, once fished out of the vat of boiling oil, these are crispy crescents of heaven, to be eaten fast before they deflate. There’s also a knack to eating them (sideways) to avoid all the cheese and tomato sauce falling to the bottom. Unlike a calzone these tend to be stuffed with ricotta cheese rather than mozzarella and make a great lunch before heading off to explore the city on foot to work off the calories, and there’s a lot to explore. Naples has the largest historic centre in Italy, which since 1995 has been listed as a UNESCO World Heritage Site. The name of the Antica Pizza Fritta Da Zia Esterina Sorbillo is a mouthful but so are the pizze fritte. 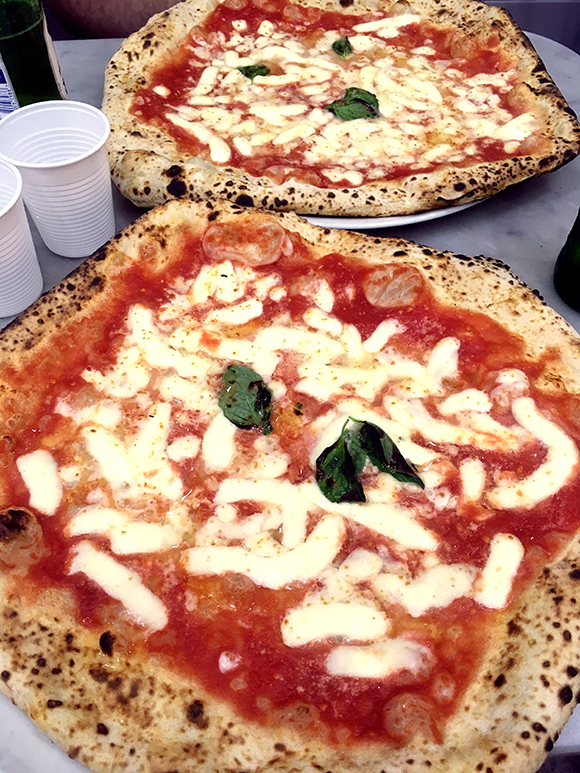 Located on the Via dei Tribunali, one of the main streets in the historic centre, your pizza is freshly fried in front of you and can be eaten on the go or in the room behind the kitchen. You can find it at via dei Tribunali 35, Napoli. The Isle of Capri isn’t technically part of Naples, but it might as well be. You can see it rising out of the sea across the bay of Naples and it only takes 45 minutes on the fast ferry to reach it. Famous for its boutiques and beaches, it has two dishes named after it, the torta caprese, a sinful chocolate cake, and the insalata caprese, a patriotically coloured salad of tomato, mozzarella cheese, and basil. Don’t get sand in your sandwich. Just by the ferry stops in Marina Grande, the Salumeria da Aldo will make you a fresh caprese salad in a sandwich to take off to the beach. And what a sandwich. It’s true that mozzarella always tastes better in Campania as it is as fresh as it can be, and nothing can prepare you for the reality. From the salumeria, you can take the funicular railway to Capri village and then a bus down to the beaches on the north of the island. It’s located at via Cristoforo Colombo 26; 80073 Capri. The graffa started off as carnival food, but the buongustai Neapolitans decided it was just too good to be eaten for only one week a year and so started making it all year round. It’s a kind of donut, made from flour, sugar, and potato starch, the latter ingredient lending it a lightness that makes you feel more righteous about eating them. Chalet Ciro a Mergellina, at the end of a beautiful walk along the sea front from central Naples, have been serving them to crowds since 1952, and they are so popular that they’ve even set up a special graffa queue. New on the menu is their latest invention, ice-cream served in a graffa cone. Interested? They are at Via Caracciolo, 80122, Napoli. Much has been written on the origins of the pizza, including theories that it originated in Ancient Roman times, or the obviously incorrect story that it was invented in the USA and brought to Italy by American soldiers during the Second World War. I say obviously since restaurants in Naples were serving it at least as early as 1889, when Raffaele Esposito of Brandi’s served a cheese, tomato, and basil pizza for Queen Margherita of Italy, giving it its name. Whatever the origins, all Italians accept that this is a Neapolitan dish, and although now you can find it all over Italy—which did happen after the Second World War—Naples is its spiritual and literal home. Don’t mess with the margarita. This poem is written two meters high on the wall of the Pizzeria da Michele, the oldest (since 1870) and most famous pizzeria in Naples. Their pizzas are considered to be the best in the city and, therefore by implication, in the world. As a local taxi driver told me, don’t be put off by the queue outside. Make your way to the front and get a numbered ticket—if you have a number, you’ll eat. And anyway, standing outside in the warm evening watching the doorman calling out the numbers using Neapolitan bingo slang—75 Pullecenella (Mr. Punch), 85 ll’aneme ‘o priatorio (the souls in Purgatory … obviously waiting for pizza too)—is entertainment in itself. We were waiting for about an hour, which didn’t seem long when finally they called number 97 (unfortunately the bingo slang stops at 90) and it was time to eat. They’re queueing for a reason. The inside is as basic as their menu: pizza margarita or marinara, normal, medium, or with double mozzarella. This could be washed down with water, coke, fanta, or beer (Italians NEVER drink wine with a pizza). In the center, behind an iron cage (presumably to keep the hungry souls in purgatory) the pizzaoiolo practises his art in front of an open, wood-fired oven. Behind the oven, the obligatory patron saint (of pizza?) watches the whole affair from his niche on the wall. The pizza is astounding and in fact will slightly change your conception of what pizza is supposed to be. The sourdough crust, soft as memory foam around the edges and thin as paper underneath, was the perfect mattress for the tomato sauce, barely melted milky mozzarella, and the fragrant basil leaves on top. Eating here will in fact ruin pizza for you for a while, since you leave with the impression that no pizza will ever taste as good unless, of course, you come back to da Michele’s. The one thing it won’t ruin for you is your bank balance: pizzas cost between €4 and €5, and drinks €2 each. Da Michele is located at Via Cesare Sersale 1/3, 80139, Napoli. Have you been to Naples? I’d love to hear about your foodie experiences. I studied ancient art and archeology at University and had been wanting to visit the museum since I went to Pompeii at the age of 18. I finally got there (walking off the pizza fritta) and spent the whole afternoon with my mouth open in amazement (I am told). I’ve heard about those Glasgow pizzas. I believe they are sometimes fried directly from frozen? These are another thing completely and all freshly made in front of your eyes … although they are a ‘bomba’ as they say in Italy! Oh, I loved the graffa, and had one every darn day. I dream of graffa. I’ve never had anything quite so light and fluffy since. I need a trip to Napoli!